The KONG Senior Large is a dog toy specially designed for the older dog (7 years +) or light chewers. It has a special soft rubber formula for the elderly dog in comparison to the large Classic Kong. Even older dogs need to have fun and play to prevent boredom and at the same time the large Senior Kong helps to clean their gums and teeth. The Senior is the same as the Classic Kong, Extreme Kong and Puppy Kong with a hollow centre so that you can stuff it with treats for your dog to get out, therefore stimulating their interested so they entertain themselves and works great at preventing boredom and getting them active. It can also be used as a throw or chew dog toy. Made from a gentle senior Kong natural rubber, perfect for older dogs. Hollow centre designed for stuffing with treats. 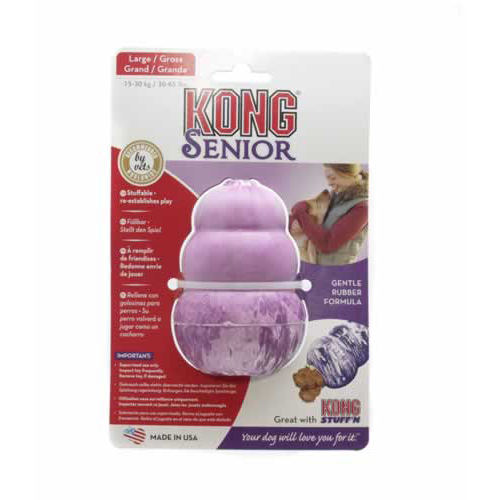 All Kong Senior's come in a purple/white colour and are available in three different sizes. See our Kong Stuffing Techniques and Kong Stuffing Recipes for ideas on what to put in your dog's kong. Afghan Hound, Airedale, Alaskan Malamute, Bassett Hound, Bearded Collie, Belgian Shepard Dog, Bernese Mountain Dog, Borzoi, Boxer, Briad, Bulldog, Chow Chow, Clumber Spaniel, Dalmatian, Dobermann, Elkhound, English Setter, Flat Coated Retriever, Foxhound, German Shepherd, Golden Retriever, Gordon Setter, Greyhound, Hungarian Vizsla, Irish Setter, Irish Water Spaniel, Kerry Blue Terrier, Labrador, Lurcher, Munsterlander, Newfoundland, Old English Sheepdog, Pharaoh Hound, Pointers, Standard Poodle, Rough Collie, Saluki, Samoyed, Shar Pei, Siberian Husky, Soft-coated Wheaten Terrier, Springer Spaniel, Staffordshire Bull Terrier and Weimaraner.